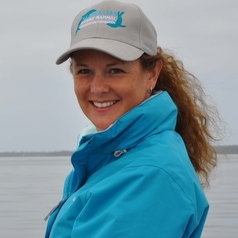 Dr Kate Charlton-Robb is the Founding Director and Head of Research at the Marine Mammal Foundation. With over 16 years experience researching dolphins across southern Australia, Kate achieved a Bachelor of Science (Hons) with a double major in Freshwater and Marine Ecology and Zoology and a Doctor of Philosophy (Genetics). Her research led to the formal description and naming of a new Australian species of dolphin, the Burrunan dolphin, Tursiops australis. Kate is also currently the President of the Australian Marine Sciences Associations – Victorian branch, a Naturalist with One Ocean Expeditions in Antarctica, an Honorary Fellow at Deakin & Monash University, a Research Associate at Museum Victoria.